MANILA, Philippines - Unbeaten superflyweight contender Drian (Gintong Kamao) Francisco of Sablayan, Mindoro Occidental, is lined up to fight for the WBA title before the year ends and his manager Elmer Anuran said yesterday he’ll be ready to face either the winner of the Nobuo Nashiro-Hugo Cazares rematch or Vic Darchinyan for his chance of a lifetime. 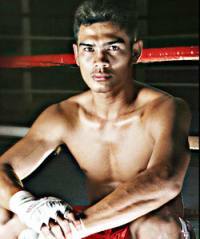 But Anuran said to seal the deal, Francisco must hurdle Panama’s Ricardo (El Matematico) Nunez in a title eliminator at the Ynares Gym in Pasig on April 17. The WBA recognizes two world titlists in the 115-pound division. Darchinyan is the “super” titleholder because he is the unified WBA and WBC champion while Nashiro holds the “regular” WBA belt. WBA executive vice president Gilberto Jesus Mendoza Jr. recently advised Anuran that he has broached the possibility of Darchinyan defending his twin titles against the Francisco-Nunez survivor. Anuran said he is also open to Francisco challenging the winner of the Nashiro-Cazares return bout in Osaka on May 8. Anuran confirmed that the Nunez party is arriving from Panama on April 8. The fight was originally scheduled on March 27 but Nunez got WBA approval for a postponement after suffering a cut on his left eyebrow during a sparring session. Anuran said Francisco, 27, isn’t bothered by the postponement, adding it will only delay the inevitable. Anuran said Francisco watched Pacquiao’s recent fight against Joshua Clottey on TV and was impressed by the Filipino icon’s stamina and strength throughout the 12-round bout. Nashiro, in his second reign as WBA champion, battled Cazares to a split draw in Osaka last September and has been ordered to engage the Mexican in a rematch. The Japanese fighter has a 13-1-1 record, with eight KOs and never fought a Filipino. Cazares, 31, has one Filipino victim, Eric Jamili whom he knocked out in three rounds in 2003. The Mexican has a 30-6-2 record, with 22 KOs. Darchinyan, 34, is coming off a win on points over Rodrigo Guerrero last March 6 to retain his WBA and WBC crowns. He has fought five Filipinos so far, losing to Nonito Donaire Jr., drawing with Z Gorres and beating Glenn Donaire, Diosdado Gabi and Federico Catubay. Francisco learned how to box from his father Joe, a former pro who is now a fireman. Early in his pro career, he was trained by former world flyweight titlist Erbito Salavarria. Francisco zoomed to No. 3 in the WBA ratings after stopping Vasquez in the 10th round for the vacant WBA International superflyweight diadem at the Cuneta Astrodome last October. The win raised Francisco’s record to 18-0-1, with 14 KOs. Francisco has never fought abroad but Anuran said at this point in his career, he’s willing to go anywhere for the chance to win a world title. His list of victims includes fighters from Thailand, Korea and Indonesia. Vasquez, 22, has a 17-1 record, with 15 KOs. In preparing for Francisco, his manager Rogelio Espino recruited interim WBA flyweight champion Luis Concepcion and WBA No. 2 flyweight contender Jean Piero Perez of Venezuela as sparmates.